The country’s largest reality firm DLF, is no more the title sponsor for the IPL as it didn’t renew its contract which was due last month. DLF name had almost become synonymous with IPL in last 5 years… More often than not it was termed DLF IPL everywhere, and not just IPL! So, was the decision to pull out of IPL Sponsorship a wise one? Lets look…. DLF which went public in 2007, a year before IPL started had invested Rs 250 crore over the 5 years of its association. The Rs 50 crore spent each year has established DLF as a brand all over the country and is now among one of the most recognized brands. The familiarity with the DLF brand has now increased much more than it ever was. According to me the decision to pull out of the IPL was a wise one. According to statistics, viewership kept decreasing season by season. DLF had achieved what it wanted out of IPL and probably much more than that. Because it was the title sponsor, DLF also got visibility on Volkswagen Vento cars that were marketed as DLF IPL limited edition and from other similar product tie-ups which also gave DLF got huge publicity. Now DLF is looking at sponsorship of other sports. It will now look at the sports which have become popular because of the recent Olympics. Rs 1 crore to the winner of DLF Masters (Golf). Investing 2 crores in the upcoming Davis Cup tennis tournament in Chandigarh. Supports Haryana Open Badminton Championship. Gifted Audi Q5s to 4 Olympic medal winners. Special edition Maruti Suzuki SX4s for 15 sportsmen from Haryana who didn’t win medal. And a few other sports they promote locally in Haryana and Delhi as well. So basically DLF has understood that if they want to establish themselves in a region, to grab the attention of the people across the economic status, sports are the best possible way. They aren’t just sponsoring already established games but also the emerging ones. Once they tap an emerging sport, it gives them an upper hand for the years to come, because initially it will not face any competition in sponsorship, and gain goodwill along with branding. Goodwill will come in the form of promoting local talent. How does goodwill translate to sales? Well not directly but a brands identity drives investment. Once a brand sets its place in the heart of the locals, the wallets will follow. Now they are looking not for being a franchisee or owning a team but are looking for tie-ups with govt, federations or academies. The sport(s) that they will choose to invest in will depend upon their ventures in new markets and of course one which is emerging of late. My money is on tennis, boxing, shooting or even wrestling looking at the current attention and interest they have generated after the Olympics. The amount that they will be investing will be less than they did in IPL each year and will probably help in bringing more medals at premium events, rather than putting money in a sport which already has huge money flowing into it. And this move will surely be welcomed by govt and sportsmen alike. "DLF quits IPL Sponsorship…reason? ", 5 out of 5 based on 1 ratings. H1B, L1 Visa norms get even more tougher! IPL 4 Auctions : What’s in it? Who will be the Newsmakers? India do not find major sponsors other than DLF or Sahara. But it may be a rumors out coming but finally they never quit..As first also Sahara plans to quit but after several negotiation with BCCI and ICCI finally they agreed to continue like the same it may be also a political drama. 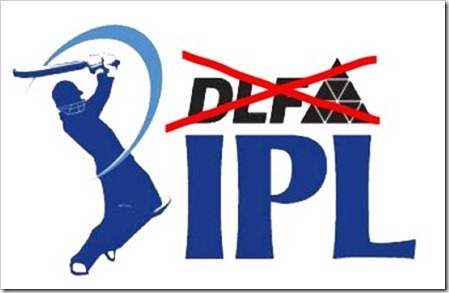 Why DLF quit the IPL sponsorship Simple……. BCCI raised the sponsorship rates for the title sponsor by 4 times How in the world could DLF support it .They left knowing very well that Vodafone is waiting in the wings willing to pay the premium price. and well, right now almost all the top non-IT firms are in soup. GMR GVK and ADANI too are deep in loans. There are other issues involved. 2007 when DLF started Title sponcership was boom time for Real estate business. All the companies in Real estate, borrowed heavily at higher interest and invested in land banks. Once the sector crashed in 2008 recession, none of the Real Estate businesses recovered. They are left with land bank whose value eroded and a loan on which the interest cost keeps eating into net worth of companies. Some companies have reached a state where the turnover goes to service interest costs. Forced to take bitter pills, the first priority of every company became cutting down on loans. Every company started selling landbanks, SEZs. DLF has a loan outstanding of 23,000 crores. The interest cost alone is 2,500 crores every year. They have to generate a profit more than 2,500 crores just to keep the nose above water. In such situation, every day we read news in business media what DLF is selling. DLF has set a goal of reducing loans by 5,000 crores every year. As part of the plan, they started selling properties. May be DLF thinks 50 crores a year is too much for sponcership of IPL. As the author is saying they already got the media coverage. May be they want to consolidate on that created Brand image now. A simple math can tell that a 50 crore can service a loan of 500 crores. It a lot of money even for DLF. I think this is the real reason. viewer know ipl as dlf ipl.. some people may have felt that ipl’s full name is dlf ipl..